Introduction to Sports Biomechanics: Analysing Human Movement Patterns is a genuinely accessible and comprehensive guide to all of the biomechanics topics covered in an undergraduate sports and exercise science degree. 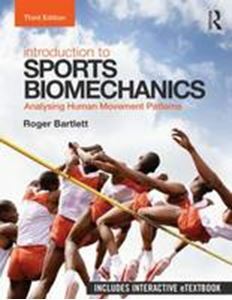 Now in a fully revised and updated third edition, the book explores both the qualitative and quantitative analysis of human movement, covering the following key topics: * Movement patterns - the essence and purpose of sports biomechanics * Qualitative analysis of sports movements * Sports movement patterns and the geometry of motion * Quantitative motion analysis in sports biomechanics * What causes sports movements? Forces and moments of force * The anatomy of human movement Every chapter contains cross references to key terms and definitions, learning objectives and summaries, study tasks to confirm and extend understanding, and suggestions for further reading. In addition to the printed textbook, readers of this new edition will also have access to an Interactive eTextbook version, a new kind of e-book that can be used on both mobile and desktop devices offering students an unparalleled level of interactivity. Featuring video, data files, pop-up definitions, hyperlinks, self-test quizzes and interactive labelling and sorting tasks, this new electronic edition brings the subject of sports biomechanics to life like no other textbook. With downloadable resources also provided for instructors, including PowerPoint slides and answer guidelines, this remains an essential course text for students of sport and exercise, human movement sciences, ergonomics, biomechanics, physical education, and sports performance and coaching.